With over one million books sold in her career, Joyce Rupp presents her newest undertaking: a unique collection of daily meditations that draw from Christian, Jewish, Muslim, Hindu, and other sources, offering wisdom and insight about the God who is beyond all names. 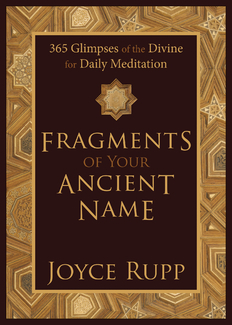 Best selling author Joyce Rupp once again proves herself a wise and gentle spiritual midwife, drawing forth 365 names of God from the world’s spiritual treasury. Fragments of Your Ancient Name—whose title comes from a poem by German mystic Rainer Maria Rilke—assembles a remarkable collection of reflections for each day of the year. This unique and profound devotional will heighten awareness of the many names by which God is known around the world. Whether drawing from the Psalms, Sufi saints, Hindu poets, Native American rituals, contemporary writers, or the Christian gospels, Rupp stirs the imagination and the heart to discover a new dimension of God. Each name is explored in a ten-line poetic meditation and is complemented by a simple sentence that serves as a reminder of the name of God throughout the day.